Hello, my name is Kierste, and I’m a total fontaholic. I LOVE finding and using different fonts in all my projects, and while I have purchased several fonts I adore, I’m always on the hunt for FREE and FABULOUS fonts. Of course I want to pass on my finds to you, and with the start of school quickly approaching, I thought it would be fun to share my most favorite and free Back-to-School fonts! Aren’t they delicious? YUM!! And yes, I’m describing fonts as if I could eat them, because that’s how much I love them! Use these darling fonts to create fun gift tags, jazz up school projects, and more! You can even just stare at them a little, like I do. ☺ Once you download these fonts, you can use them in Word and Excel, editing programs like Photoshop, and Silhouette software. Did you know PicMonkey now lets you use all your own fonts too? I was SO happy to discover that! If you haven’t used it before, you should really go check it out. You can create your own printables, and edit your photos, FREE! 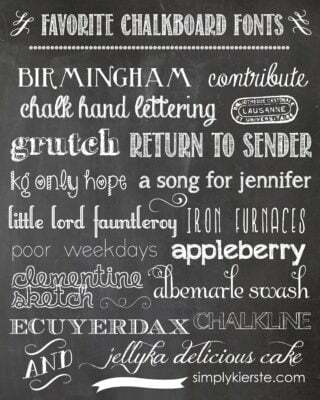 If you love these fonts, check out these adorable CHALKBOARD fonts!! Hi Kierste! Thank you so much for these amazing fonts!!! How do you use them once you download them? Are they automatically added to your word processing program or do you have to do that manually some how? Sorry for the extra questions. This is my first time to try adding new fonts. THANK YOU SO MUCH for your wonderful blog! God bless you & your family! Thank you so much, Kierste! It worked! I am so excited! I have wanted to add some new fonts for a long time, but I didn’t know how to do so! I am a homeschooling mom & can hardly wait to try out some of these new fonts for our notebooking pages in the coming school year! You are a HUGE blessing! :o) Thank you again!